Some designs make my heart beat a little faster, some I don't get. When I first saw the design for the so-called Straddling Bus by Chinese company Shenzhen Hashi Future Parking Equipment Co. I didn't know what to think. First off the Straddler doesn't really look like a bus, it's more of a subway. Second, why on earth would you want to design a bus that allows other vehicles to pass underneath it? It sounds like a technical- and design nightmare. Anyway, the system was unveiled at the Beijing International High-tech Expo last may, so some people are taking it very serious. 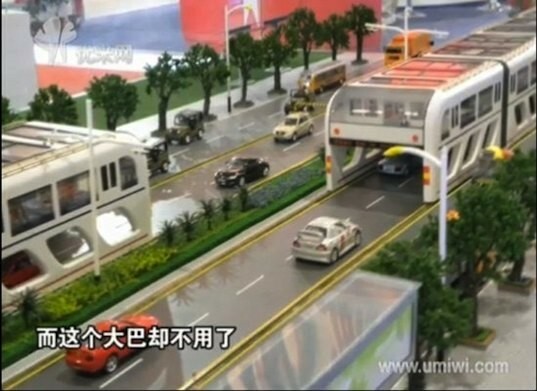 The vehicle is a 4 to 4.5 meter-high subway car with passenger boarding on the upper level and a hollow shell on the lower level for vehicles to pass through. The specs for the new system sound (almost) too good to be true; capacity for 1200 to 1400 passengers, reduction in traffic jams by 20% to 30%, and cheap building costs (10% of the cost of a traditional subway). Sounds like fiction? 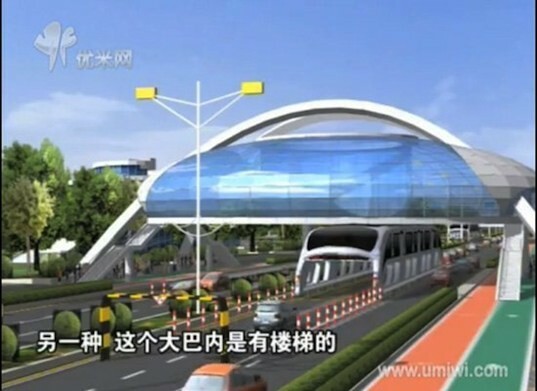 Beijing is starting a pilot in a major business district.